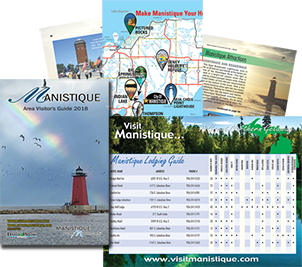 Come to the beautiful Manistique area and experience breathtaking scenery, four seasons of outdoor sports and numerous historical landmarks. 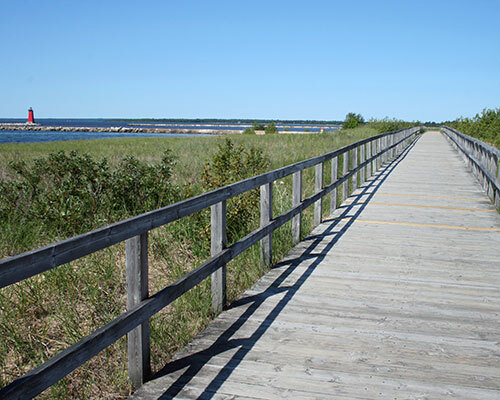 Whether you enjoy nature, boating, fishing, camping, snowmobiling, hunting, shopping, dining or just relaxing, the Manistique area offers a wide variety of opportunities for vacation fun. Palms Book State Park is located at the northern terminus of state highway M-149, a fifteen minute drive north of US-2 at Thompson. 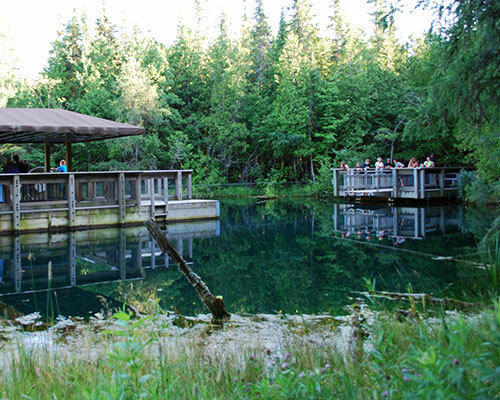 It is a rewarding side trip for the vacationer touring the Upper Peninsula, for here can be seen one of Michigan's alluring natural attractions Kitch-iti-kipi, The Big Spring. "The Big Spring" is the largest in Michigan - forty feet deep and over 10,000 gallons of clear water gush per minute from the fissures in the underlying limestone. Crystal clear, 45 degree water supports a large raft from which you can view this beautiful, giant spring and its inhabitants. Seul Choix Point Lighthouse (pronounced SIS-SHWA) in nearby Gulliver, Michigan was built to light the way for the increasing number of vessels carrying the iron ore that was being shipped out of Escanaba,MI. Seul Choix Point Lighthouse is now a community park for everyone to enjoy. Built: 1895 this light, whose name is French for "only choice", was once the center of a thriving fishing community in the only harbor of refuge along this stretch of Lake Michigan. Today, the lighthouse complex is the only thing that remains active. Fayette was once one of the Upper Peninsula's most productive iron-smelting operations. Located on the Garden Peninsula at Snail Shell Harbor. When the charcoal iron market began to decline, the Jackson Iron Company closed its Fayette smelting operation in 1891. It is now a completely restored village including 22 historic buildings, museum exhibits and the visitor center, which can be toured May through October. The historic site is located in Fayette State Park. Indian lake State Park is located on Indian Lake, the fourth largest inland lake in the Upper Peninsula with an area of 8,400 acres. It is 6 miles long and 3 miles wide. The lake was once called M'O'Nistique Lake. 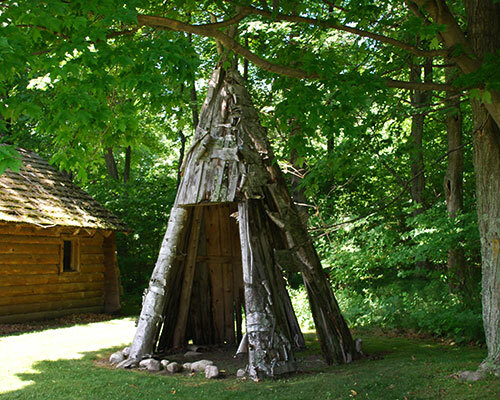 According to surveyor records dated 1850, Native Americans lived in log cabins near the outlet of the Lake. Seney National Wildlife Refuge was established in 1935 for the protection and production of migratory birds and other wildlife. Today the Refuge is comprised of a rich mosaic of marshes, swamps, bogs, grasslands, and forests. Nearly two-thirds of the Refuge is classified as wetland. The refuge Headquarters and Visitor Center are located on Highway M-77 approximately 3 miles north of Germfask, Michigan and 15 miles northwest of Curtis, Michigan. It is one of the best wildlife excursions you can make, it is managed by the U.S. Fish and Wildlife Service. The Hiawatha National Forest is located in Michigan and encompasses about 879,600 acres. It is composed of two units, stretching from Lake Michigan, on its southern border, to Lake Superior in the north. The Thompson Fish Hatchery is located about eight miles west of Manistique on County Road 149. It is one of six hatcheries operated by the Fisheries Division of the Michigan Department of Natural Resources and is open for tours. Most of the hatchery's annual production is cold water species such as brook trout, splake, brown trout, rainbow trout and chinook salmon most of which is planted in Upper Peninsula waters. Kewadin Casino, located in Manistique, offers all the excitement of a full-size casino, featuring Blackjack, Craps, Poker, Bingo, Keno, Roulette and slot machines. Complimentary casino shuttle services available to all hotels. Try your luck and join the millions of players who take their chances, become high rollers, or beat the odds at the area's largest gaming complex. The Schoolcraft County Historical Park, in Manistique, features a museum and the historic 200 foot tall brick water tower. The octagonal tower, built in 1922, has a capacity of 200,000 gallons and was built in the Roman style of architecture. Listed on the National and State Historic Registers, the Water Tower commemorates the birth of Manistique's municipal water works. The Tower, park and museum are maintained by the Schoolcraft County Historical Society and are a short stroll from the Siphon Bridge. The newly restored Siphon Bridge spans the Manistique River and flume and was originally built in 1919 to channel water into the paper mill. In its orginal form the bridge was listed in "Ripley's Believe It or Not" because the road was acutally below the level of the water in the flume. A unique waterfront tasting room. Sit on the dock and enjoy a glass of wine. Hours are Thursday through Saturday 10-5pm. Located on US HWY 2 in Manistique, MI The park was renamed in July of 2014 after the famous Shipwreck of the Carl D. Bradley.